Sarah Bell explores the postwar experiences of Australian nurses who were held in captivity during the Second World War. Australia has a long and repetitive history of men and women returning from conflict traumatised and scarred, beginning most visibly with WWI. While historians such as Joy Damousi and Stephen Garton have written extensively about the relationship between Australian veterans and trauma, there is still a lack of social, cultural, and institutional acknowledgement of the ongoing impact of warfare after service has ended. Perhaps, worst of all, is the sense of complacency from those that do recognise veteran trauma. There is a tendency to categorise these struggles as being the norm, to be expected, rather than using these experiences as the catalysts to institute change in a broken system. 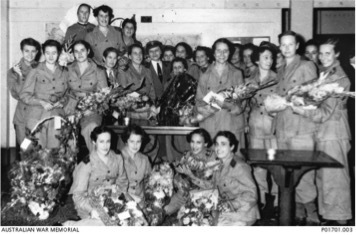 The postwar lives of the Australian Army Nursing Service (AANS) nurses who became prisoners of war (POWs) under the Japanese during the Asia-Pacific War are intrinsically part of this history, and are tied to the legacy of neglect, misunderstanding, and apathy shown towards veterans affected by their war service. A photo of the AANS POWs on the hospital ship Manunda, 1945. Image via the Australian War Memorial. The AANS POWs were prisoners under the Japanese for over three and a half years, and in that time they experienced extreme neglect, starvation, and degradation at the hands of their captors. Of the 65 nurses that evacuated Singapore on the passenger ship the Vyner Brooke and the six nurses who made up a larger group captured in Papua New Guinea, the number of women who survived their time as POWs and their subsequent illnesses would become less than 30, with the last remaining nurse dying in 2011. Following the end of the war, the entirety of the combined group of 30 nurses experienced poor health. As studies by historians such as Christina Twomey have established, the unsanitary and rudimental living conditions of the camps and location led to a multitude of tropical illnesses and infections that had ongoing impacts on the health of these people. Nurses such as Betty Jeffrey and Lorna Whyte spent years in hospital after their return as they fought to stave off illnesses such as tuberculosis. Eileen Callaghan and Vi McElnea struggled to regain their health and passed away within a decade of their liberation. Others would go on to develop bowel, back, joint, lung, and heart conditions because of a variety of conditions first contracted or as a direct result of camp life (Beri-Beri, dysentery, unsanitary water, malaria, malnutrition, and sleeping on concrete floors for a long period of time to name a few). Many nurses would seek financial and medical support for these conditions during this postwar period in the form of a pension. However, nurses faced difficulties in obtaining a pension, especially one proportionate to their needs. There was very little documentation of their health during the war, and even less official understanding of their experiences despite seemingly abundant public sympathy. What is less acknowledged in the little literature that exists on the postwar lives of AANS POWs is how the nurses were affected psychologically. Given the cultural unwillingness to discuss or label mental health in postwar Australia, the language that the women themselves used to describe their experiences were not always as explicit as “depression”, “anxiety”, or “trauma”. Instead, they referred to symptoms that became habitual. For example, many of the nurses developed an aversion to waste and hoarded food, an inclination stemming from the lack of basic necessities during their imprisonment. Others developed “reactions” to stress, tending to disengage and hide away when faced with difficulty. Sylvia Muir developed intense claustrophobia and fear of being unable to escape, which she poignantly described as the feeling of “I want to be free, I’ve got to be free”. For others, it was the need for community and unspoken understanding, often seen through the desire and abundance of relationships, between the nurses and other POWs and veterans. Through common experience and shared trauma, the nurses found the support and understanding that they lacked from wider Australian society. Perhaps these relationships also offered nurses a distraction from their own suffering by fulfilling, once again, the role of nurturer and carer for others. The small, often forgotten AANS POW community is a microcosm of Australian history and broader world history. The AANS nurses were a community forged and changed by war, unique in their experiences and position in society following the war, and continued to feel the effects and consequences of their war service until their deaths and beyond. Nurse Vivian Bullwinkel (later Statham) was a pioneer for the advancement of nursing – a historically exclusively female workforce – as a legitimate and academic profession. Together with fellow nurse Betty Jeffrey, the two raised funds and established the Nurses Memorial Centre in Melbourne as a living memorial to those nurses lost during the sinking of the Vyner Brooke and during captivity. The Nurses Memorial Centre also acted to promote and support the accessibility and advancement of nursing in Australia. 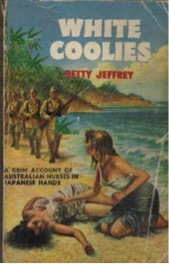 An original cover of the published diary of AANS POW Betty Jeffrey, released in 1952. Image via the National Library of Australia. However, while the platform used to achieve these goals was one linked to the notoriety of their experiences, it was not one that either of these women took any great pleasure in using. Following their return, the Australian public interest of the nurses was highly personalised, particularly focusing on the more ‘sordid’ aspects of their captivity such as potential sexual abuse by Japanese guards and other atrocities. This thrust into fame created the expectation that these women be open and vulnerable about their experiences when speaking publically, despite the overwhelming nature of their trauma and the difficulty of reassimilation into civilian life. The most visible and well-known figure of this community is Vivian Bullwinkel, the sole survivor of the Bangka Island Massacre that saw the mass shooting of men and women who had escaped the sinking of the Vyner Brooke, including 22 AANS nurses. Despite her notoriety and outspokenness, Vivian was a shy, softly spoken and reserved person who was made to be a public figure, and of whom the Australian public and the media demanded a level of emotional vulnerability and personality. Vivian used her platform to campaign for memorialisation, advancements in and respect towards all nurses, and in the pursuit of female empowerment, and did so through becoming the antithesis of what people craved of her— embodying stoicism and reality over emotion and vulnerability. As a result, Vivian’s life until her 60s was lived for others and devoted to making use of the time she felt privileged, but perhaps even guilty, to have when so many of her friends died and suffered so that she could survive to tell her story. The postwar lives of the AANS POWs represent a rich and diverse history of close-knit community entrenched in physical and psychological trauma as a result of their captivity- stories that are as important today as they were at the time. To forget about the AANS POWs is to ignore the ongoing impact of warfare and trauma, and to trivialise the role that society and culture have on how history is written and social hierarchy is formed, both to the benefit and detriment of a community. 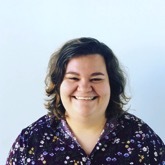 Sarah Bell is a Masters student at The University of Notre Dame Australia, Sydney. With a strong interest in social history, her current research focuses on the history and representation of AANS POWS in Australian culture.